Cashew Coconut Salmon Curry is easy to make and crazy delicious. 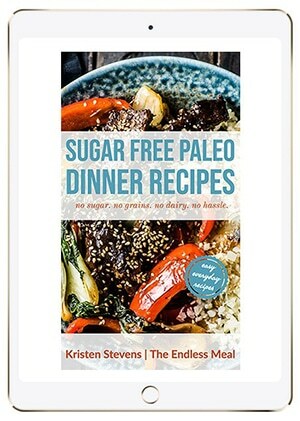 We love it over paleo and Whole30-friendly mashed sweet potatoes but it also goes well with steamed rice. 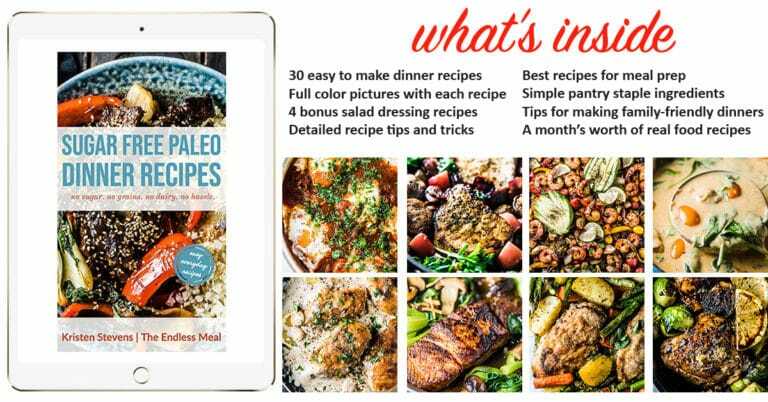 Remember those 7 Staple Whole30 Sauces that I shared with you last week? This salmon curry is one way you can use one of those tasty sauces. The Thai coconut sauce is one of my favorite sauces in last week's line up and I knew I wanted to share it with you again; this time transformed into a healthy dinner recipe. Creamy coconut sauces are THE BEST! ← fully deserving of all caps. The extra creamy sauce thickens just right with the addition of raw cashews or cashew butter. Salmon that stays nice and tender from being gently poached in the sauce. Amazing served over mashed sweet potatoes. Just as amazing served over steamed rice. Or cauliflower rice. So many options! Whole30 compliant + paleo + dairy-free + gluten-free + so delicious that you'd never guess this recipe is so good for you. Salmon is one of my favorite fish to eat, but it can be a little tricky to cook as it becomes dry if overcooked even a little. The easiest way to make sure this doesn't happen is to gently poach the salmon. Many years ago, I shared the post Perfect Poached Fish with you. I'm sure I don't need to tell you that it didn't turn into a roaring, viral hit. Poached fish sounds tasteless. BUT it is a great way to make sure the fish you're cooking stays nice and tender. The trick is to cook it over very low heat. I've given more detailed instructions in the Perfect Poached Fish post, but basically, you want only a few small bubbles rising in the cooking liquid. If the pan is boiling (or even simmering) turn down the heat! The other option is to use Steelhead Trout, which is a lot like salmon only fattier. Fattier fish are easier to cook as they don't dry out when cooked as quickly as their lean cousins. One thing you need to know is that this salmon curry is EASY. The most time-consuming part of the recipe is boiling the sweet potatoes that you serve with the salmon. If you skip that part (and you totally can if you're in a hurry) this recipe will take you literally 10 minutes to make. The curry sauce is a simple, coconut-based blender curry. By that I mean put the ingredients into your blender and blend until smooth. They make the salmon curry extra creamy. The add extra healthy fats. When the sauce cooks, the cashews help to thicken the sauce. If you have a high-powered blender (like a Vitamix) you can easily blend the cashews completely smooth. If not, cashew butter is a great alternative. Once you have your coconut curry, dinner is so close to being ready. 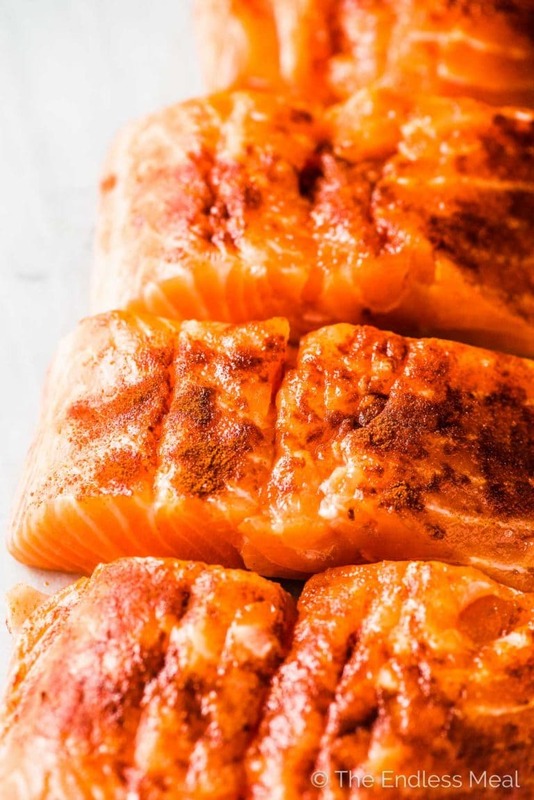 Now all you have to do is sprinkle some paprika and salt over the salmon, sear it on one side in a hot pan, then flip it over and pour the curry sauce into the pan. Then simmer the salmon over medium heat for a couple minutes to finish cooking it. I sprinkle some raw diced red peppers over the salmon on my plate. The sweet crunch they give to this dish takes it over the top. If you love recipes like this Thai Salmon Curry, make sure to check out my cookbook Sugar Free Paleo Dinner Recipes! Place the sweet potatoes in a pot and cover with water. Bring to a boil over high heat then reduce the heat and simmer for 15 minutes, or until they are soft. Drain the water, mash the potatoes, and season to taste with salt. 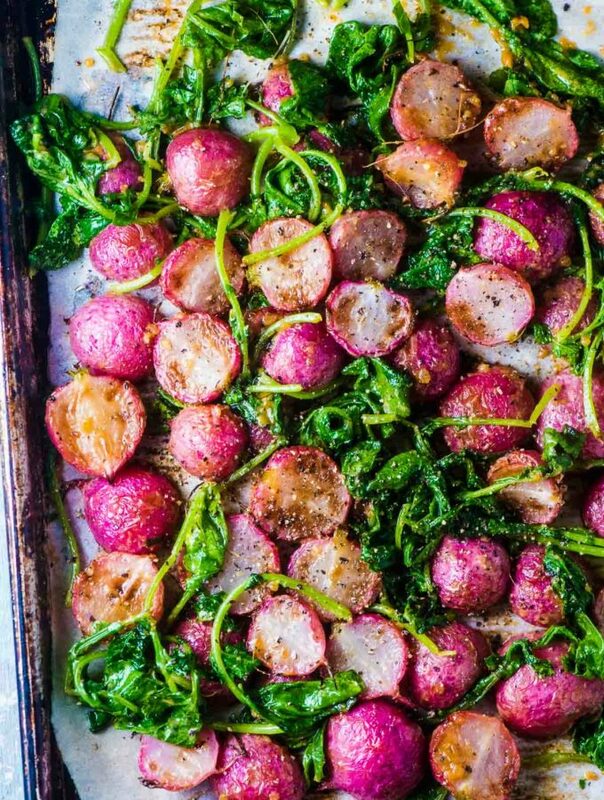 While the potatoes are cooking, prepare the rest of dinner. Place all the cashew curry sauce ingredients plus 1 cup of water in your blender and blend on high until smooth. Sprinkle the paprika and salt over the top side of the salmon. Heat the coconut oil in a large skillet over medium-high heat. Add the salmon, top side down, and sear for 3-4 minutes, or until they are golden. Remove the pan from the heat, lower the heat to medium, flip the salmon over, then pour the sauce into the pan. Put the pan back on the heat and cook for 4 minutes more. 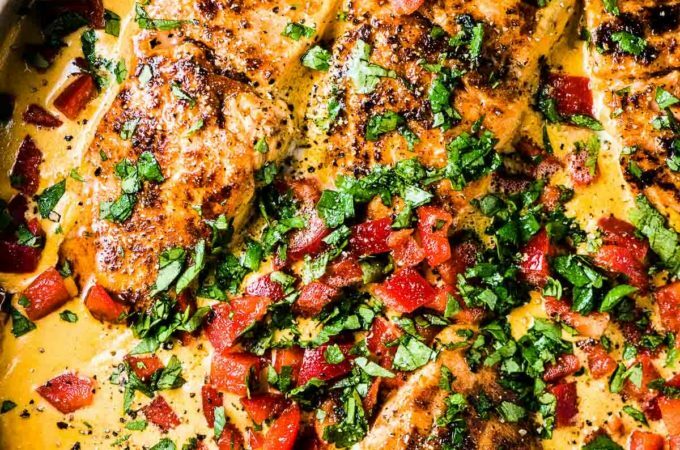 Serve the salmon over the mashed sweet potatoes with the sauce, the red peppers, and cilantro over top. If you don't have a high-powered blender (like a Vitamix) use 1/3 cashew butter instead. If you like Whole30 recipes like this Salmon Coconut Curry, check out my cookbook Sugar Free Paleo Dinner Recipes! 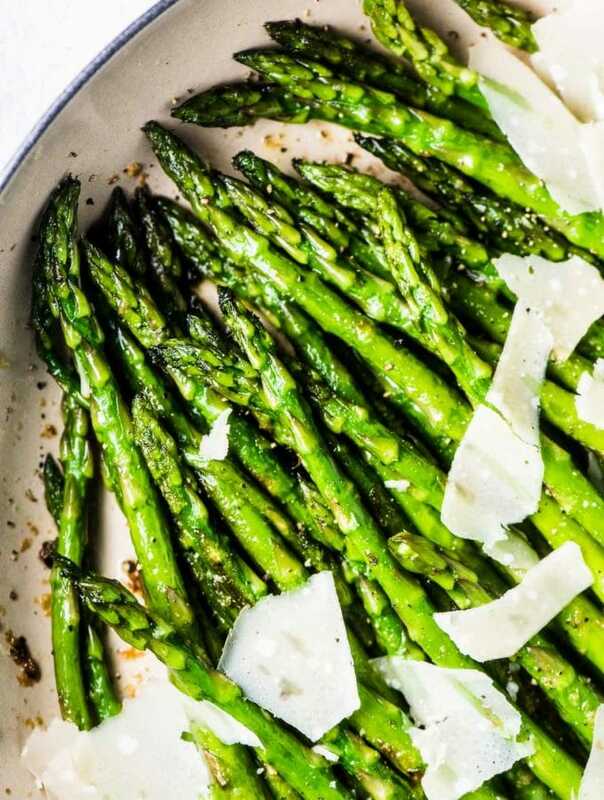 Would love to try this recipe but have a quick question. What kind of coconut milk do you use? Canned? Full fat?